Now, to the story of the sausage bread. Grandpa Frascatore aka “Andy” taught all of his sons, daughters-in-law and grandchildren (me) how to make the sausage bread. Often we did it at Christmas or Easter. It became a tradition. At holiday time, I used to make it for potluck at the office. (It was always gone in 2 minutes and everyone asked for the recipe.) It still has a specific food memory for me when I eat it. And I still remember the first time Andy showed me how to make it. I hear his voice in my head. He could chop, julienne and cube perfectly, like Chef Morimoto. A few words before we get to the recipe…. Note: ratio is always same as for each loaf, you can increase slightly for bigger loaves after you go through process once and see how you like the sizes, and we do bigger ones at holidays. You know how in cooking books, on TV and online “it is about the best ingredients”. In this case, I am not kidding. The four main ingredients of sausage, provolone, Parmigiano and dough are key. It pays to go to local Italian Gourmet store and pay for good sausage, cheeses and dough. We have Ferrucci’s in Little Silver grate fresh Parmigiano Reggiano for us. The imported provolone costs a little more but it is worth it. Their homemade Italian sausage is far better than the prepackaged supermarket brands. The recipe causes the whole house to smell like sausage so it is a good idea to do this on a day when you can open the windows during the frying process. The recipe is easy. You just need a little space and the time to prepare it. We usually do two loaves at once. One is eaten the day it is made. The other is frozen for future use. At the holidays, we cook several over the course of a weekend. Some we freeze. Others are given to friends and family as a parting gift. Once the loaves are completely cooled, wrap them first in plastic and then with aluminum foil and freeze for up to one month. Just remember to remove the plastic before you reheat them it in the oven. I always write that note of caution on a label and apply it to the loaves. A few years ago, I forgot this important step and almost ruined a friend’s Festivus dinner. But that is a posting for another time…..
For non-meat eaters, an option is to make with garlic instead of sausage. We do not specify the amount of garlic. It depends on your personal tastes. We also do not advise using raw garlic but chopping fine and toasted golden brown with some olive oil. Try a large amount of 4 or 5 cloves and see how it cooks down and tastes in the bread the first time. From past experience, a little garlic goes a long way. This is evident in the fact that when my family makes garlic loaves they are sometimes labeled with “a skull and crossbones”. Sausage bread is an appetizer or snack and usually does not last very long. We usually eat it with salad. Garlic version goes very well with plate of pasta or salad too. I have yet to meet someone who eats it and does not like it…. The recipe is provided below. 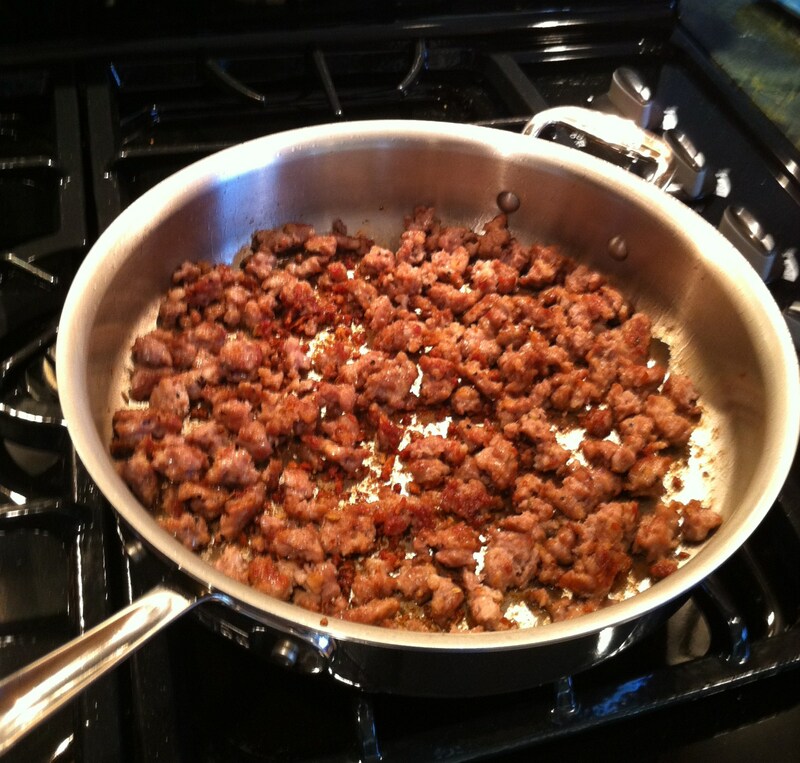 Take sausage out of casing and fry in pan. You want sausage cooked fully and a little carmelized with dark brown bits but be careful not to over cook. Good Italian sausage is very lean. It can become dry because of the low fat content. Place in bowl and to the side to cool a bit. Cut up provolone into ½ inch cubes. Flour counter and rolling pin (we like french rolling pins). 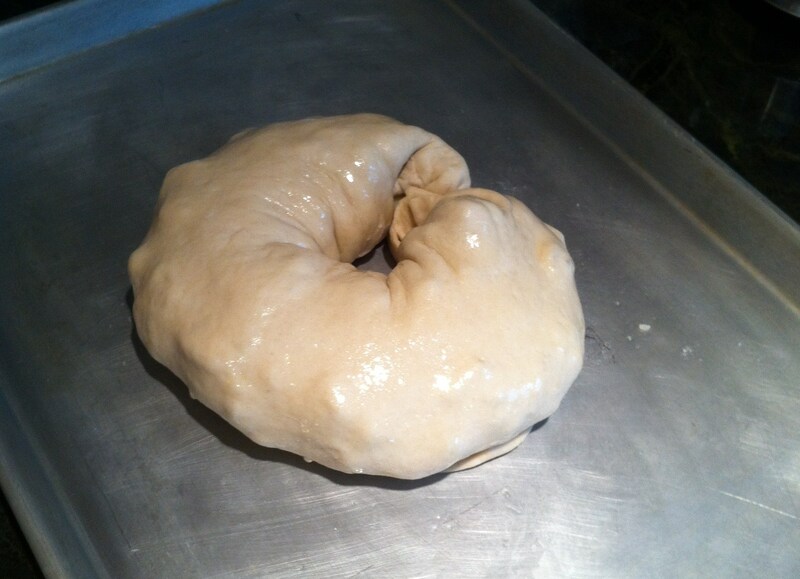 Roll out dough to 18 inches by 18 inches. Apply a little olive oil to lightly coat the baking pan. Starting at one end, about 3 inches from the end start a “layer of ingredients”. Each layer is a line of ingredients, then you fold the dough over and repeat until you finish all the dough. Here’s how you make the “layer of ingredients” take a spoon and scoop up sausage; layer sausage about 1/2” high, lay a provolone cubes across entire layer of sausage , then sprinkle parmesan across entire layer and then black pepper across too (a little pepper goes a long away, have fun with the parmesan). 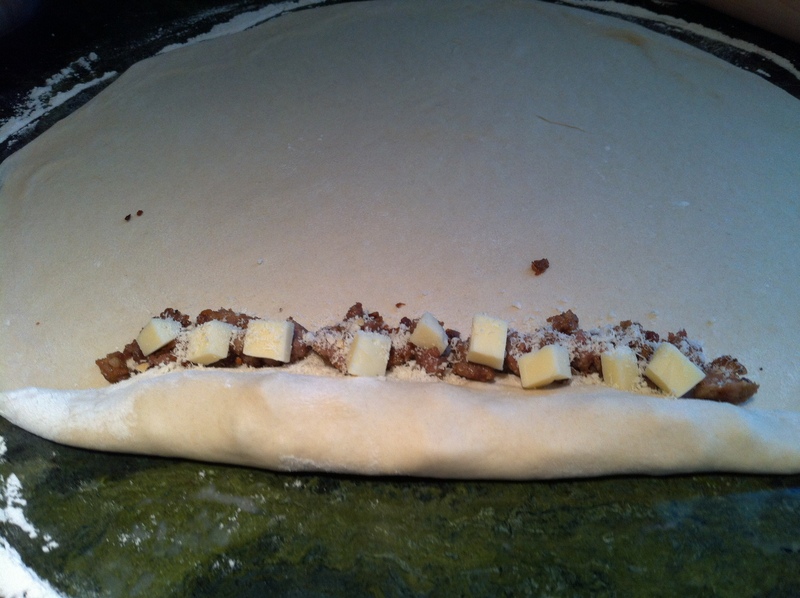 Take the end of the dough and fold over until you have covered previous layer. 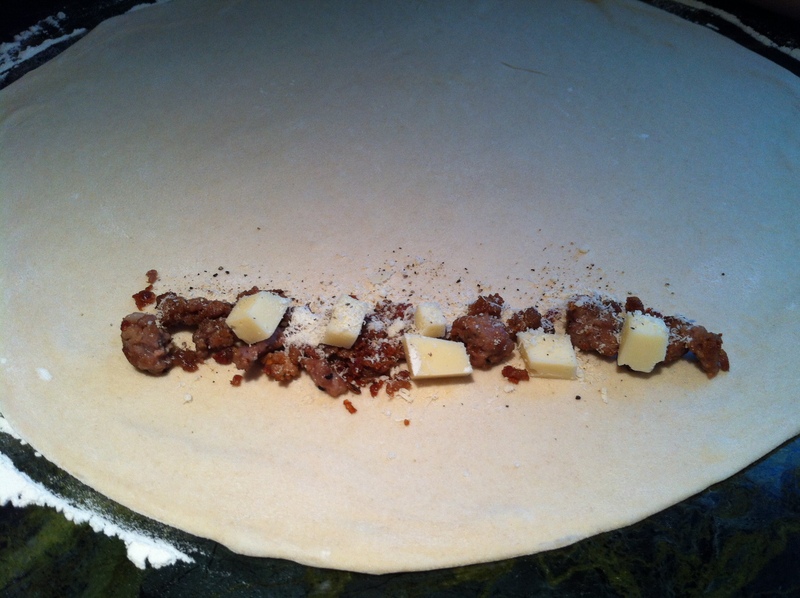 Layers at beginning and end of dough should be a little smaller. Leave yourself and 1-1/2 inches to 2-inches on each side so it is easier to fold over. This prevents ingredients form seeping out of dough when it cooks. Repeat the steps above until you have about 3 inches left. Place on pan greased slightly with olive oil, put a very little olive oil over top of bread for browning. Cook 20-25 minutes in middle of oven (not too close to top of the oven because you can burn top of bread). *Note: You have to keep an eye on the bread while it bakes. If it starts to get a little darker on top, put a piece of aluminum foil over it and cook another 5 minutes or so (Cooking a little longer is better). We mix it up, mostly sweet sausage and then ask Italian store to throw in a little hot sausage, 1 link should do it. Serve in square HUNKS, no neat slices! Slice loaf up and put in the oven, this helps it to heat up faster and the bread gets a little crispier. ← A few words about sharing recipes…and those who do not. Awesome recipe – these would make a delicious lunch. Tube pans usually have caps that fit on the ends. To use it:Grease the insdie like you would any bread pan. Put on one end cap. Mold your dough into a tube shape about 1/2 the size of the tube and slip it insdie. Put on the other cap. Let the dough rise until it nearly fills the tube and then bake at 350 for about 30 minutes or until the bread is evenly browned.If you do not have the end caps, stand the tube on a tray, fill half full of dough and allow it to rise until the dough is nearlt to the top. Baking is the same.You can also use the tube for steamed breads such as Boston Brown Bread.I would be concerned about glass but if it does break, just throw it all away including the bread. Any kind of glass should be pretty safe at baking temperatures.The reason for the tube is to shape the bread loaf for fancier sandwiches. Bread tubes come in many shaped including diamonds, hearts, clubs and spades as well as many simple animal shapes. Have fun! I’ve been lucky enough to have Janine make this for me. It is delicious!!! Thanks, we have one in the freezer and I may bust it out this weeked. Remember the time I brought it over for Festivus dinner and as soon as we put it in the oven, we remembered “oops there is a layer of saran wrap on it, may be a good idea to take it off before we heat it up” LOL! If it is dense and chewy, it didn’t rise enough. I’ve never made bread using a bread maker my mom does tuoghh but she uses boxed mix. I would suggest reading the directions on your bread maker all brands are different. My boyfriend’s mom makes something similar, only she uses a homemade dinner roll dough which is just slightly sweet and uses mozzarella instead of provolone. It’s my boyfriend’s favorite dish EVER. She does just a single layer in the dough, so sometime I might have to try rolling it like your Grandpa does! Use your bread machine to just make the dough. Then bake it in the oven. You let it rise a liltte longer so it gets a bit bigger than double in size. Put a pan of water in the bottom of the oven while it rises. 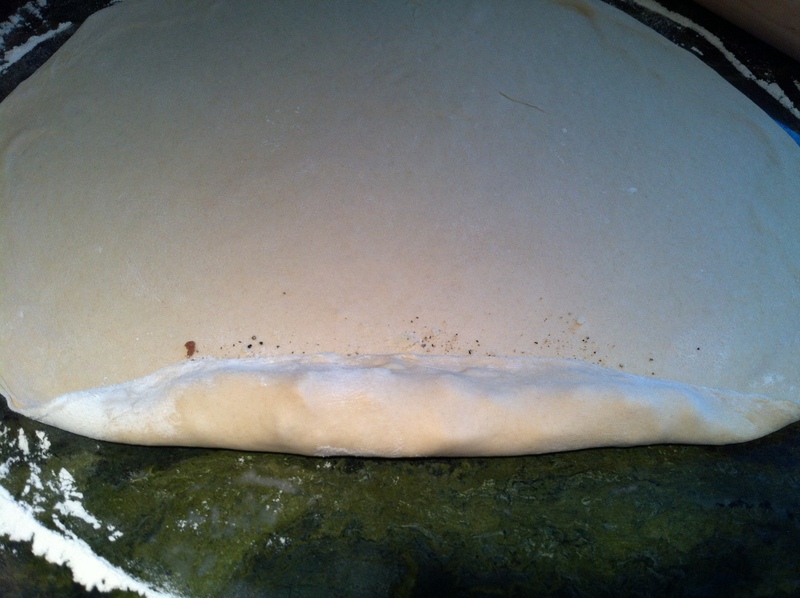 When the dough has risen slash it several times across the top. Spray it with cold water. Pop it in the oven at 375 degrees F. and bake for 25 minutes. Spray it with more water every 10 minutes. French bread needs more moisture. Here is a good recipe for French Bread.French BreadLarge Loaf1 1/2 C. water1 1/2 tsp. Salt2 Tbsp. Sugar4 C. Flour1 1/4 tsp. YeastIf wanting to bake in Oven. 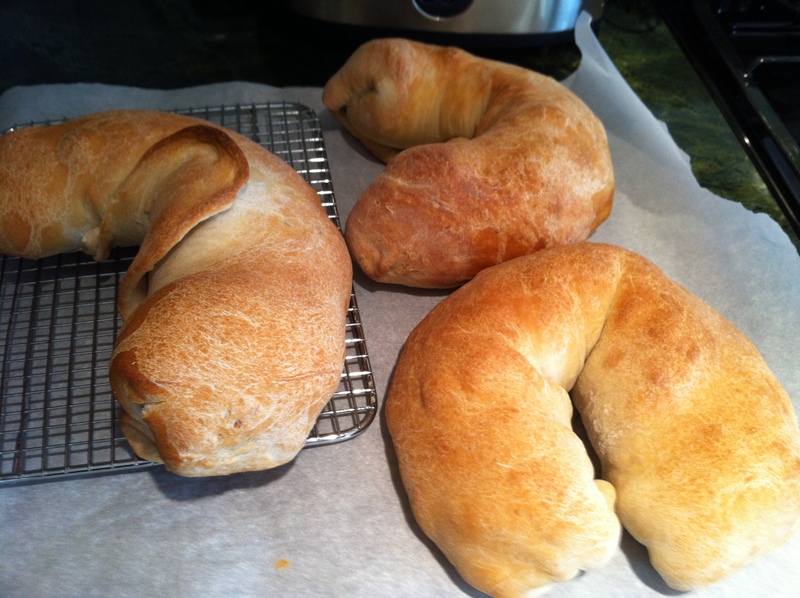 Shape dough into a long Frenchbread shape and place on cookie sheet and let riee till doublein size.About 45 min. I place the pan on the stove top with theoven on and cover with tea towel. It rises well thgere. When ithas risen put a few slash marks on it with knife across thewidth not the length. Pop in 375 F. oven on middle rack andbake 20 to 25 Min. till golden brown and sounds hollow whentapped. -Hope you enjoy.